A Windows version is also available. 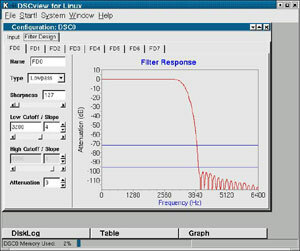 Microstar Laboratories includes appropriate software from DSCview in its support for development environments that include Kylix and GNU C++. So customers can, if they wish, program their own user interfaces to replace DSCview. All user interfaces share a common look and feel to designing and configuring filters. 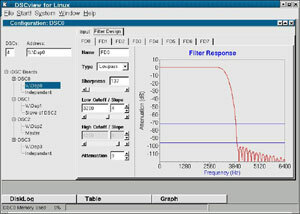 iDSC filters are activated through the Configuration Window, which has a Filter Design tab to display the Filter Design Screen and an Input tab to display the Input Screen. Signal conditioning is activated through the External Board tab, which is hidden by default and must be explicitly enabled. 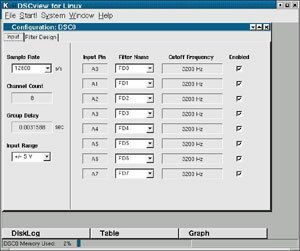 Support for multiple iDSC boards is activated through the Group Interface, selected through the DSCview menu, System|Board Setup Display. There are three types of output data screens: graph, table, and disk log. The user may have any number of graph, table and disk log screens. 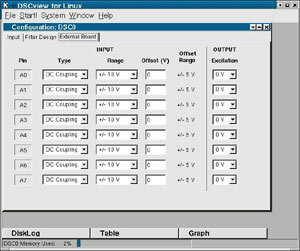 You may obtain a copy of DSCview for Linux in one of two ways. You may download a copy of the DAPtools Basic CD; this includes all of our user manuals and the DSCview for Linux software. Or you may contact us and ask for the software. Microstar Laboratories supports a limited set of commercial Linux distributions. Contact us for details. Return to the Software page or iDSC 1816 page.